My first impression was more or less “wow”. :) The monitor is big, matt black and easy to put into operation. The monitor comes completely assembled with the stand attached, you can just put it on your desk and turn it on. It’s foolproof: Attach your VGA or DVI cable and push the big button. There’s nothing to be configured (unless you want to). The stand of the SyncMaster 245b stands out positively. In contrast to most other stands of the cheap 22” class, you can adjust it in height and turn it. Especially the height adjustment is ultra convenient. My SyncMaster does hang almost on eye level – higher than any of my former monitors at which I usually had to look down a little. According to the manual, it is also possible to rotate the screen upright. In reality this does not quite work. On another website, I read that you can remove a safety screw from the turntable to unlock this feature. To do this, you first have to unscrew the monitor from the stand to get access to this screw. I did not test if this trick does really work. Of course, you would have to try this at your own risk – I’m not responsible if something breaks! :) Anyway, I think it is an interesting option and I’ll probably test it somewhen. Unfortunately, the SyncMaster 245b can only be titled 3° downwards. I’d prefer more, because I usually sit very low while watching movies. Other monitors do not offer much more, though. I wonder why – this seems like an obvious field for improvement. At least you can tilt it 25° upwards – much more than enough for me. Samsung’s SyncMaster 245b uses the cheapest TFT technology that is currently available: A TN panel. This panel type is infamous for it’s limited angle of vision. The SyncMaster 245b can’t beat this basic weakness. Especially vertically, the angle is very limited. The brightness changes immediately as soon as you leave the perfect height. For me, the effect is most visible on yellow backgrounds – they usually never appear completely homogeneous, but turn into a kind of color gradient. Personally, I can live with this limitation quite well, but it is something you need to be aware of. TN panels are also not very renowned for their color rendering. I do not have the equipment the color quality, so I can only offer my subjective impression: The colors are good. Every now and then I work with photos and videos, so I do care about colors. I do not need colors which are identical on my monitor and any other device, because I don’t work in prepress and my photos are going to look slightly different on any monitor anyway, because 99% of all monitors out there are not calibrated. Using test pictures, you can see a few steps in gradients. They are not very bad, but they exist. As far as I know (don’t nail me down to this), they exist because the SyncMaster 245b can not – like most monitors of this class – natively render full 16.7 million colors, but needs to interpolate a few missing ones. I only see this in extremely smooth gradients and have never seen them “in real work life”, but illustrators should be carful at this point. I can also see some noise in certain (few) color areas. I do not know whether this comes from the monitor or from the VGA connection which I’m using. It never bothered me, though, and you have to look very closely to notice it. Unfortunately, I have to limit this slightly. I had a total of 3 monitors of this type (see noise). The first one had strange shadows in the center – probably a manufacturing error. Then an exchange monitor while my own was in service. This one gave me the impression of small interferences in the upper left corner. They weren’t much, but I saw then every now and then and over the time I found them slightly annoying. Again, the VGA connection might be the source of the problem, but I used the same graphics card and cable. Speaking of which: The VGA connection. :) Unfortunately, my laptop does not have a DVI port, so I have to use VGA. I was a bit worried about this, because people warned me of difficulties with the image quality (especially concerning the text rendering). Fortunately, these worries were pointless. My Samsung SyncMaster 245b managed to adjust to the analog signal without a hassle. The sharpness is perfect. Lacking anything to compare, I can’t rule out that the noise mentioned above is caused by the VGA connection. But even if it was, it would still be unclear if it is caused by the VGA interpretation of the monitor or by my VGA hardware. The quality of the backlight uniformity differs greatly from monitor to monitor. One of my three specimen (see noise) provided almost perfect uniformity. The second one had areas at the top and bottom which were a little brighter than the rest, but it was still ok. The lighter areas of the third one were more intense, which can be slightly distracting in some dark movie scenes. 2 of 3 specimen were ok or good, one not so good – I guess you’ll never know what you’ll get. From what I know this is a very common phenomenon with LCD displays. I don’t think the SyncMaster 245b is any different from other monitors of this class. Samsung equipped it’s SyncMaster 245b with a feature called MagicColor. It is supposed to make colors more intense or something. I was happy with the colors how they were, so I can’t say anything about MagicColor. Another feature, dynamic contrast, appeared to be more interesting in the beginning. In theory, this feature dynamically controls the backlight of the SyncMaster 245b to create higher contrasts. For example, if you are watching a dark scene in a cave or something on your SyncMaster 245b, this feature would throttle the back light so that the scene becomes even more dark. If the movie then shows a lighter scene, for example because it leaves the cave and enters bright daylight, the backlight is powered up again and you are almost blinded. I heard that gamers are always worried that LCD monitors react too slow and leave artifacts on fast movements. I did not play any games on my monitor, yet, so I can’t tell. I did not see any artifacts in movies, though. I already mentioned that I consider the SyncMaster 245b very stylish. :) It has the most beautiful design of all monitors that I currently know of. It is so beautifully simple, without any annoying ornaments. It also comes in my favourite color: matt black. The frame is small and the blue power LED looks good and is not too bright. And there are no stupid speakers attached (although you can buy them as an add-on). The whole device appears to be built well and does not look cheap. Unfortunately, I am a bit sensitive to noise. Since I own a laptop my workplace has been practically noiseless. The silence is only sometimes broken by my cpu fan. I sent my first specimen back to the dealer. For one because it had a damaged screen and secondly because it was emitting a constant noise which I could only ignore by turning on some music. The second speciment did not have the image error, but a similar noise. The only difference: With a brightness setting of 50, it is almost silent. The more the setting deviates from 50, the louder it becomes. Unfortunately, I consider it troublesome to spend so much money for a screen which I can only operate at one brightness setting…. I went to two different dealers and listened to specimens in the store. Considering the all-present noise in each store, it is hard to tell how silent a monitor really is. I just listened on the back of each specimen. One appeared to be as loud as my own. The other one I could not hear, which gave me some hope. I didn’t know of the dependency on brightness settings when I checked the silent one, so I do not know how it behaves at other settings. I noticed another small problem much later: With some screen content, there appears to be another noise of higher frequency. I think this is veeery strange because I can’t explain how such a thing could happen. Fortunately, it happens veeery rarely and is not very load. It is even dependent on your position. Moving the head by a few centimeters helps. Another thing that appears weird. :) Anyway, this problem is so rare that I do not care much about it. I talked to several support people from Samsung. Most of them told me that there should not be a noticeable noise when you are sitting in front of the monitor. On the internet, you can find different voices. The noise seems to be a common problem with the SyncMaster 245b. Unfortunately, I even found a report of a user who sent the monitor the Samsung’s service and got a less noisy but still noisy monitor back. Nevertheless, I decided to let my monitor check by Samsung – but only after I phones with Amazon and they ensured me that I can return it even if Samsung can’t send me the monitor back withing the 14 day return period. I’m very thankful that Amazon is so co-operative. The people at Samsung’s hotline are also very helpful and the service is very convenient. The monitor got picked up at my doorstep and I got a exchange model while my own is in service. I’ll update this article as soon as I get news from Samsung. Judging from my current state of knowledge, I can not recommend the SyncMaster 245b for people who care about silence. 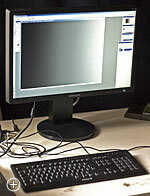 The probability to receive a monitor with noise is at least 4:1. If Samsung can repair a noisy monitor remains to be seen, but I doubt it. Also please note that I am very demanding in this point. Erik did not care about the noise and Helen didn’t even notice it at first. Wasn’t there be this annoying noise problem, I’d be completely thrilled by the Samsung SyncMaster 245b. It is cheap (starting at about 430 Euros) has a good image quality and a great stand. Additionally, Samsung’s service seems to be quite good (although this is till being tested *sigh*). I even like it so much that I do not know what to buy else if Samsung can’t fix the noise problem. *sigh* Most 22” monitors are not very beautiful and I don’t know a single one with a similarly cool stand. If I really have to buy another monitor, I’ll probably go for a 24” from LG – although I know almost nothing about it, which worries me. I can recommend the SyncMaster 245b to everyone who does not care about noise, or who is going to use it in a non-silent environment. Everybody in search for a silent workspace should better look for alternatives. I also owns the Samsung 245B, and I could see on the subject that some of these screens have a backlight too bright. Do you think this will be a failure if so do you think I should go back to SAV (Knowing that the screen is only 2 months).